In this instance, the location of the event is almost irrelevant, but it gives me a chance to illustrate what is meant by an occurrence which inevitably causes delays to the railway. Broken Rails can take a variety of guises, but that illustrated in the photos that follow is probably one of the most common. This particular incident took place on Thursday 22 April 2004. My thanks are extended to my Line Standards Manager for arranging for these photos to come into my possession. On this occasion the fault was discovered following a report by a driver at about 11.00 of a rough ride between Dagenham East and Dagenham Heathway whilst travelling west. 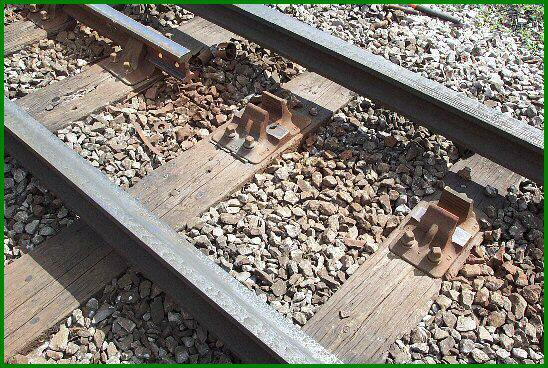 The Permanent Way track team were called to the area and the break as illustrated below was discovered. 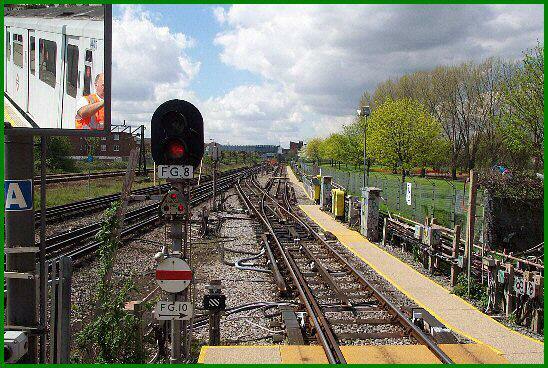 The train service was suspended between Barking and Hornchurch. The Emergency Response Unit (ERU) arrived on site at about 12.00 to assist with the necessary replacement. 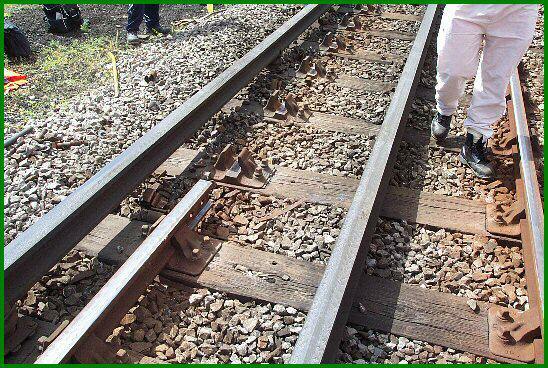 Initially it was hoped to complete the repair by 13.00, but a couple of problems prevented this, which were exacerbated by a signalling problem when the new piece of track was installed, and services finally resumed at about 14.45. 'Normal' services were not fully restored until about 17.30. 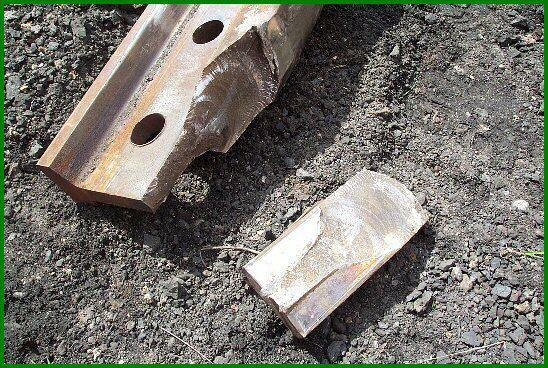 As with all metals, the steel from which rails are produced suffers from metal fatigue and will eventually cause a failure of the structure of the steel itself. Whilst I claim no specialist knowledge of the topic, the photos suggest that this was the cause. In this picture, taken from the end of the bay road at Dagenham East looking west, the Permanent Way team is visible in the distance working on the affected area. Note the illuminated Rail Gap Indicator just below signal FG8, confirming that Traction Current is discharged (switched off). 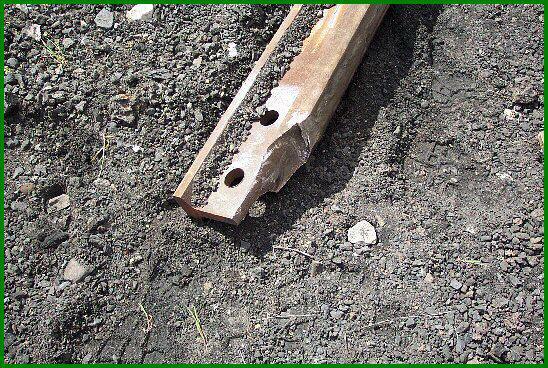 The rail as removed from the track. It is quite obvious where the break has occurred. 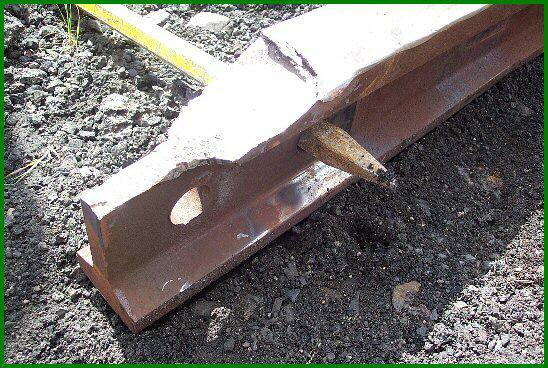 Finally, a close up of the actual fractured portion of the rail. From my limited knowledge of the topic, I believe that the curved lines visible to the right are classic signs of fatigue in the metal. Never let it be said that you don't learn anything from this site! In particular response to Image 11 above, I've received an e-mail from someone who knows a lot more about the matters of metallurgy than I, so I can do no better than reproduce the mail so you too can share the knowledge it contains! 'I am not a metallurgist but a geologist and there is some interesting evidence regarding the failure shown in your Image 11. 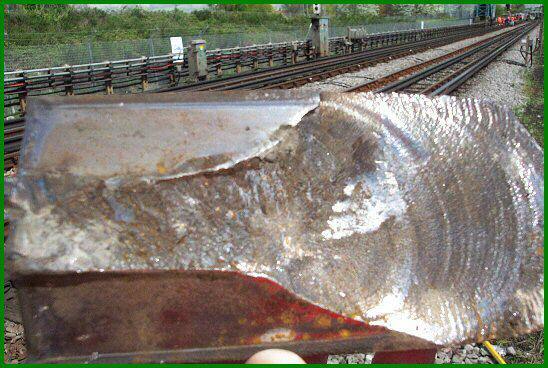 The curved lines in the metal at the right side of the image are known as a conchoidal fracture (from conch like, i.e. a shell). 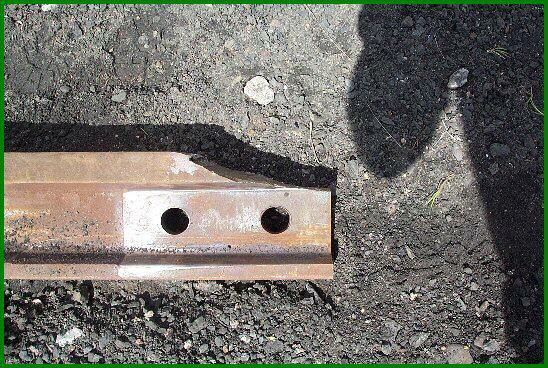 It represents a sudden fracture in a non crystalline material, in this case steel. Similar fracture patterns can be seen in fractured glass (man-made or volcanic - obsidian) and also when fracturing quartz crystals. 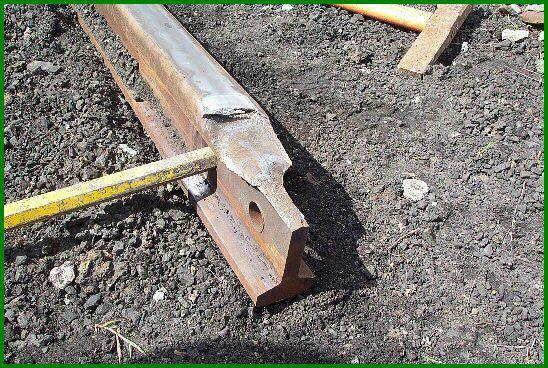 I would suggest from the clean appearance of this part of the rail that this was the last part of the rail to fracture. Many thanks to Ian in Nevada (!) for this information.